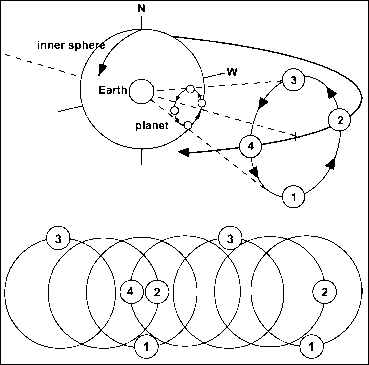 i where the index i reflects various kinds of stars (or, indeed, other sources of radiation such as emission-line gas), ni is the number of representatives of component i, and Si (A) is the intensity of the ith component at wavelength A. Using calculations of the evolution of stars with given mass and chemical composition, one can calculate the expected spectrum of stars in a given part of the Hertzsprung-Russell diagram, or the equivalent expressed in terms of the age and mass of the star. 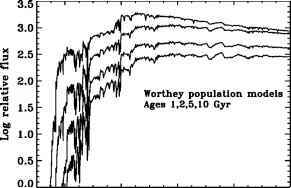 Thus, one can start with a history of star formation and predict the spectrum of the whole galaxy, an approach known as population synthesis. In practice, one might use either purely theoretical stellar spectra, or take empirical data on stars if they can be observed in a network spanning the ranges of temperature, luminosity, and composition that are needed. It is important that these entire ranges be covered; it can be shown, from the mathematics of the problem, that if some ingredient of the mix is lacking in the model, not only will the result be wrong, but it will contain no information as to what ingredient is missing. We also need to specify the relative numbers of stars formed as a function of mass, the initial mass function or IMF; while the IMF is reasonably constant in environments like nearby star-forming regions, there are signs that it may vary in regions of the most active star formation, and it was almost certainly weighted toward very massive stars ("top-heavy") in the early Universe. This approach is especially effective for old stellar systems—elliptical galaxies and the central bulges of spirals. These systems have simple histories of star formation, with little or no recent activity, making them ideal laboratories to test our ability to synthesize stellar populations. Indeed, the models predict spectra in close agreement with observations for bursts of star formation seen 11-14 billion years after the fact, and very little subsequent starbirth. Going beyond this, to infer detailed and complex histories of star formation, is more difficult. Not only are higher-quality data required, but degeneracies between various model parameters become more important. The role of dust, preferentially reddening and extinguishing the light from younger stars and from regions in the nuclei and spiral arms, becomes significant in spiral galaxies and in starburst galaxies. Still, there are trends with galaxy type that are robust to various ways of accounting for these effects. It is no surprise that spiral galaxies, in which star formation is still active, are found to have a more complicated star-formation history than ellipticals or their own central regions. The mix of original stars and more recent additions changes systematically along the Hubble-type sequence, with star formation most protracted for later Hubble types (Sc, for example). Here again we see a continuity along the type sequence, with the dynamical features producing the galaxy structure correlated with the entire history of star formation. observe galaxies at larger lookback times, when they were indeed younger. This test makes the most sense if we can preselect elliptical galaxies, to avoid mixing galaxies with very different histories. Several studies have now shown evolution in the amplitude of the break, either using selection on color (the reddest galaxies at each flux level will mostly be "red and dead'' ellipticals) or from radio flux, since powerful radio galaxies are usually found in elliptical galaxies. 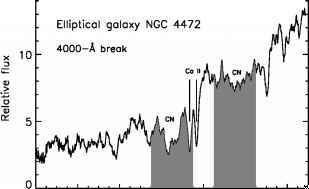 The amplitude of the break and its slope with redshift in these samples can be fit if star formation did not completely end after the initial formation of the galaxies, but continued at a low rate until about z = 1. Spectrum models also allow us to use another simple probe of galaxy evolution, a blunt instrument that is at once powerful and indiscriminate. For any scenario of how galaxies change in time as regards color and luminosity, both of which follow from the mix of star-forming histories that go into such a scenario, we can predict the number of galaxies we should see in a patch of sky for a particular color and brightness. Some of the first signs of galaxy evolution turned up in this way, as an excess of blue galaxies fainter than about magnitude 20. This in itself implied evolution in the galaxy population, though not just what kind of evolution it might be. Count analyses are very powerful in showing that something must be changing with redshift, but not exactly what it is that changes, since the count predictions involve integrations in both galaxy luminosity and redshift. Thus, the predicted counts at some color and magnitude level involve contributions from galaxies over wide ranges of distance and luminosity.